Originally on my trip I had planned to go to Florence, but, after realizing how crowded it would be, I headed towards the coast. 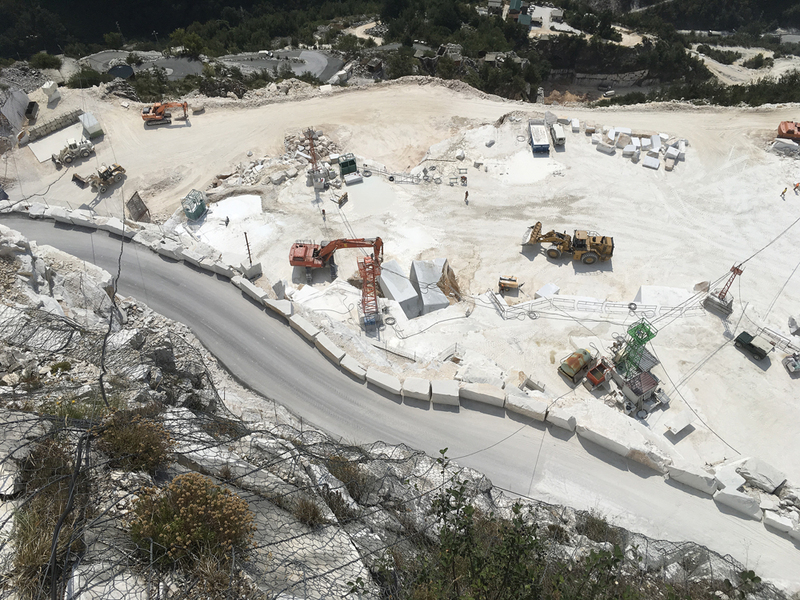 Instead of waiting in a long line and shuffling past Michelangelo’s David, I decided I’d rather ride around on the mountain where they quarried the marble for it. I still want to see David, but I’ve no regrets, Carrara is awesome. It has a sculptural quality equal to any statue. I didn’t quite capture it in the photo above, but the quarries girdling the mountain are creating a two-toned effect, weathered gray rock above a shining marble pedestal. It’s not as dramatic as the Cuernos del Paine, where glaciers created the two-toned effect instead of humans, but it’s the closest I’ve ever seen and an amazing by-product of the quarries. That’s a beautiful cliff face. 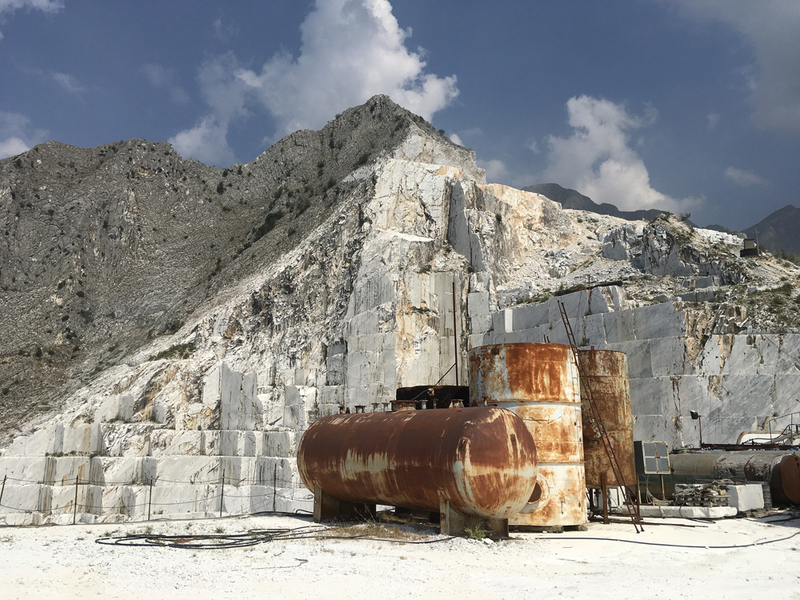 Many quarries are ugly scars, but not Carrara. 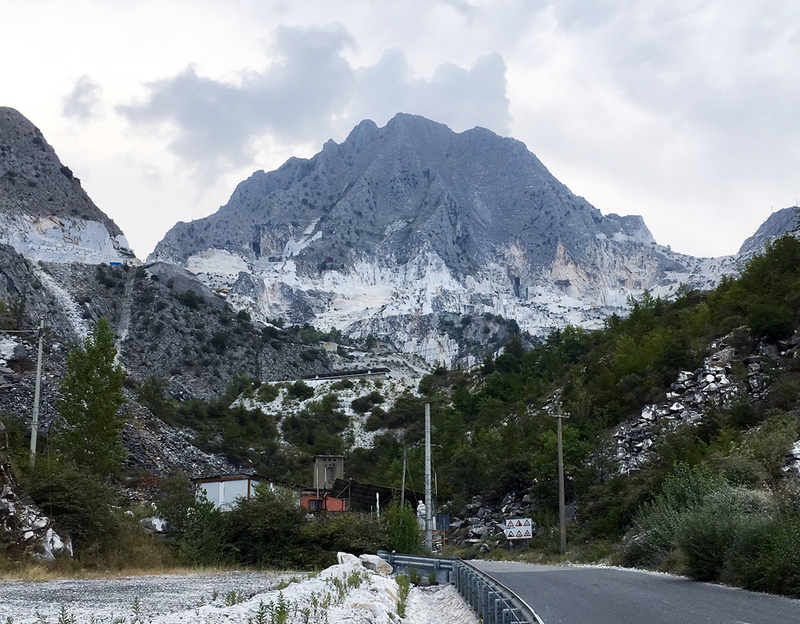 I took a tour with Cave di Marmo, and then cycled around on the roads that are open to the public. It wasn’t quite as exciting as driving an Aston Martin with thugs shooting machine guns at me, but the downhills were fun, and a long unlit tunnel was sort of scary. There was a ridge or saddle here in the past, and the quarrying is making separate peaks. 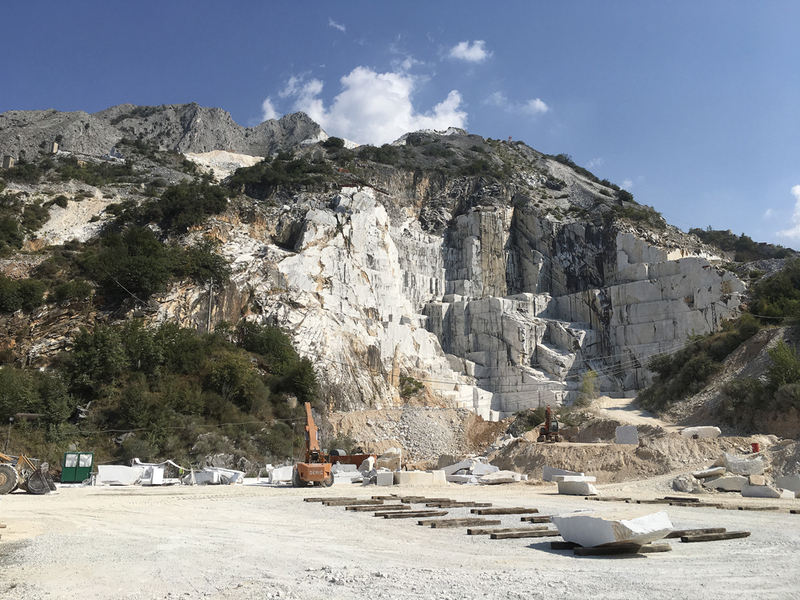 The current process in Carrara is to start at the top and work down in benches ten meters deep. They drill three holes — one from the top and two from the sides — that meet at a single point and then they run a cable with diamond-crusted studs through the holes to make a loop. The cable spins very fast and slices the stone, first one side, then the other, and then the bottom. 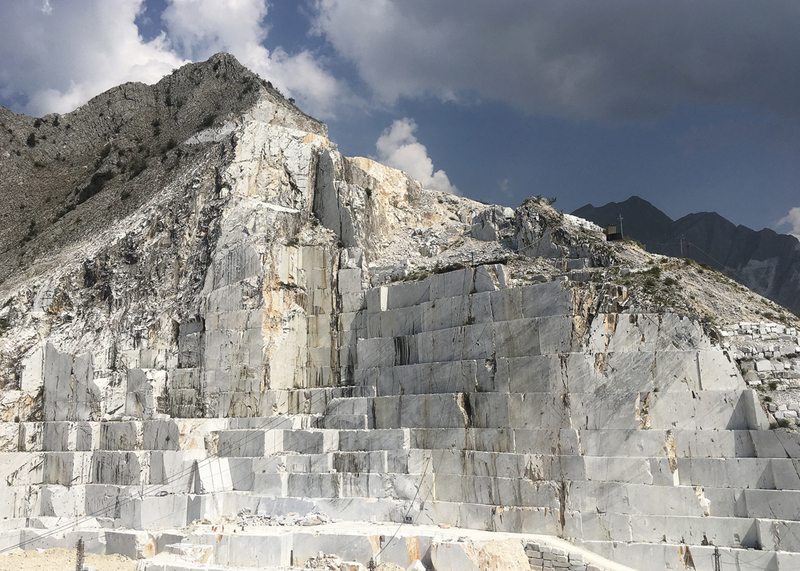 Then with machines they tip the block over onto a bed of rubble and break it down into smaller blocks to haul down the mountain and ship all over the world. The piles of rubble in the photos are there for practical reasons, to cushion the landing of the blocks as they are pulled away from the cliff, rather than sloppy housekeeping. 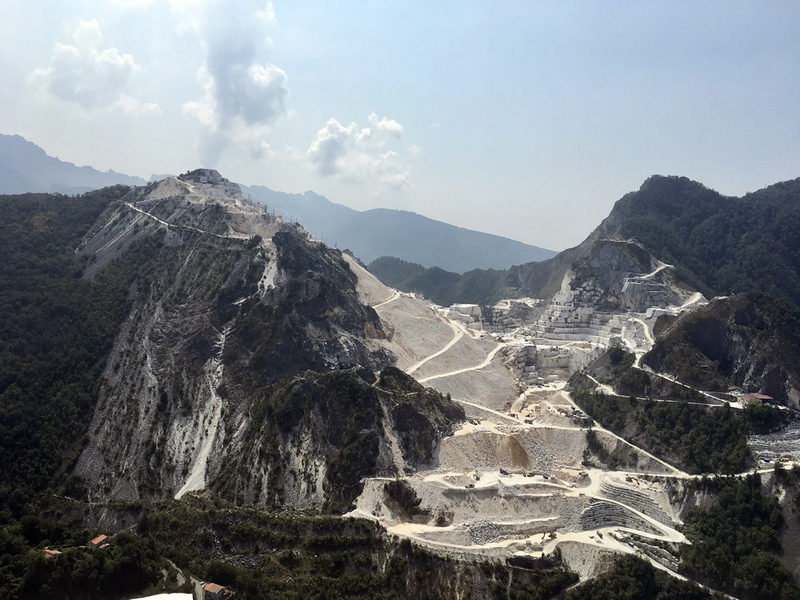 I posted a movie trailer with footage from Carrara showing the process a few years ago. Since then I’ve seen the full movie, it’s great, highly recommended. They use water to cool the cable as it cuts, so you see large puddles of milky water everywhere they are actively cutting. They fill the water tanks from springs coming out of the mountain, delicious marble-filtered water I had a chance to taste while I was riding around. I saw a trucker pull over to fill his water bottle at a roadside spring. I asked if it was ‘Buona’ and he said ‘Buonissima!! !’ Like holy water for a mason or something, perhaps my chisel will now carve with greater acuity. 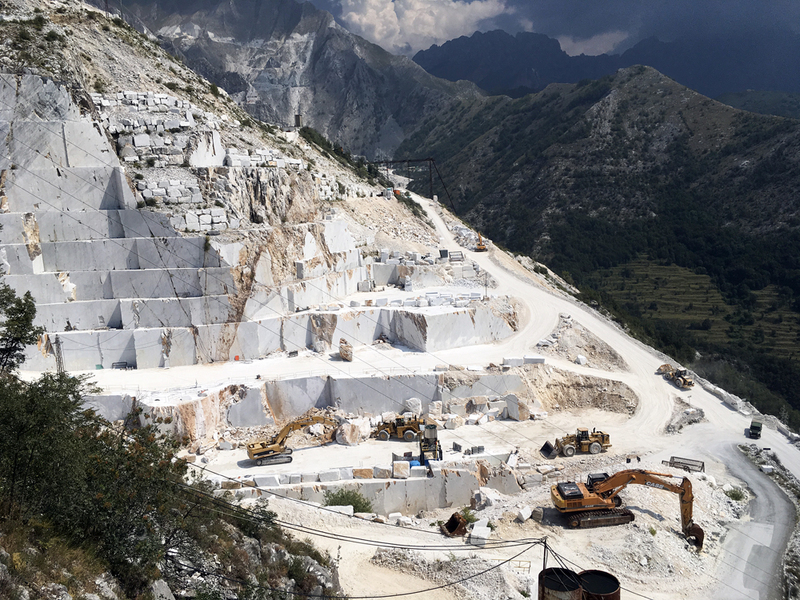 It looks like a slow unhurried process with only a few people working at a time, but then you realize the size of the stone blocks they are pulling off the mountainside. 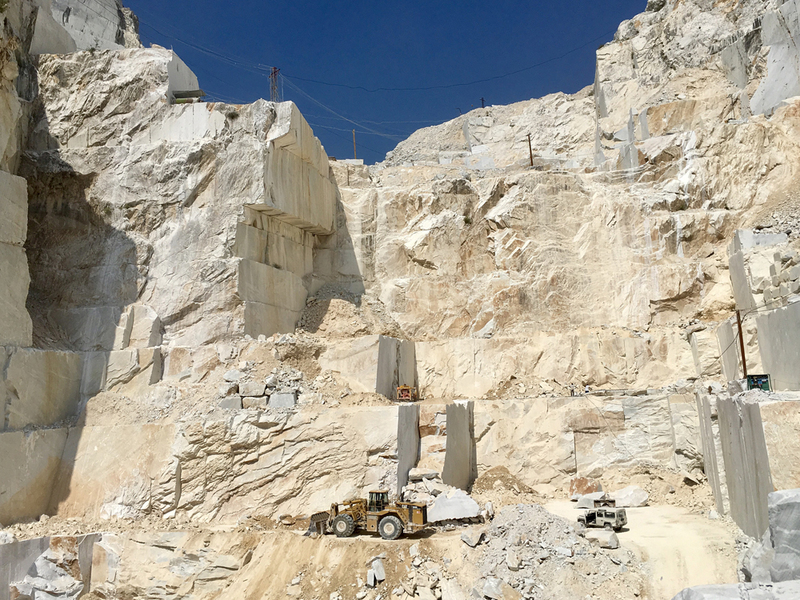 This entry was posted on Wednesday, October 3rd, 2018 at 7:28 pm and is filed under quarries, stone. You can follow any responses to this entry through the RSS 2.0 feed. You can leave a response, or trackback from your own site.